Fulfill the main objective of any practice session –maximum touches of the ball in minimum amount of time. Involve maximum number of players in a minimum amount of space. Frame the games within a set of rules to correct & improve the ‘theme’. Create competitive atmosphere resulting in improving physical fitness, technique and/or tactics. Add the variety to keep players interested. 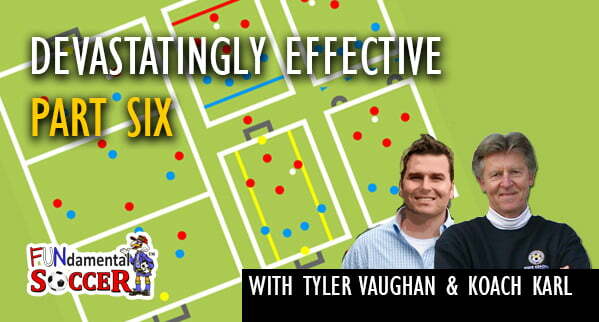 Listen to this enlightening segment as Tyler Vaughn and Koach Karl deliver Step #6 of the very comprehensive FUNdamental SOCCER “9 Step Practice Routine” with context and relevance that can be applied to any skill level and age. No matter whether you are a beginning, intermediate or advanced coach. No matter whether you are dealing with beginning, intermediate or advanced players. This podcast will challenge your current thinking/understanding of small-sided games and encourage you to consider a simpler less complicated approach … That Really Works! Thank you for taking the time to read this article, listening to the podcast and sharing both with your soccer community. Questions and Comments on this subject are very much appreciated!